1955, India. 115 min, B/W, In Bengali with subtitles. 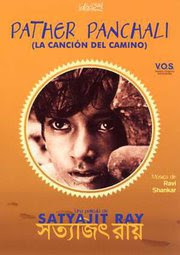 Screenplay & Direction: Satyajit Ray, based on the novel "Pather Panchali" by Bibhutibhushan Banerjee. The time is early twentieth century, a remote village in Bengal.The film deals with a Brahmin family, a priest - Harihar, his wife Sarbajaya, daughter Durga, and his aged cousin Indir Thakrun - struggling to make both ends meet. Harihar is frequently away from home on work. The wife is raising her mischievous daughter Durga and caring for elderly cousin Indir, whose independent spirit sometimes irritates her... Apu is born. With the little boy's arrival, happiness, play and exploration uplift the children's daily life. Durga and Apu share an intimate bond. They follow a candy seller whose wares they can not afford, enjoy the theatre, discover a train and witness a marriage ceremony. They even face death of their aunt - Indir Thakrun. Durga is accused of a theft. She fall ill after a joyous dance in rains of the monsoon. On a stormy day, when Harihar is away on work, Durga dies. Pather Panchali is Ray's debut film, and the first film of his 'The Apu trilogy'. The remaining two films of the trilogy, Aparajito and Apur Sansar, follow Apu as the son, the man and finally the father. Pather Panchali has a universal humanist appeal. Though the film deals with the grim struggle for survival by a poor family, it has no trace melodrama. What is projected in stead is the respect for human dignity. The most loveable character is that of Indir Thakrun, an old, cynical, loving and storytelling aunt of Apu and Durga. It was played by an 80-year-old Chunibala, a retired theatre performer who relished coming back into the limelight after 30 years of obscurity. The sequences of Apu and elder sister Durga, exploring their little world and sharing secrets are most remarkable aspect of the film. These include the scenes of - discovery of train by Durga and Apu in field of white Kash flowers, the candy seller sequence, and Indir Thakrun's death. In the inspired 'candy-seller' sequence, as Durga and Apu secretly relish tamarind paste, their mother is complaining about hardships to their father. Durga hears a faint bell. She knows it is the candy-seller. Both go out and look longingly at the the pots with sweets in them. Durga sends Apu to ask for money from their father. Mother intervenes, and Apu returns empty handed. But the site of the pot-bellied candy-seller caring two bobbing pots of sweets is too tempting to resist. Both start following him. A stray dog joins the procession as it is reflected in a shimmering pond. The film develops its characters and the atmosphere slowly and resolutely. The narrative builds up to a powerful climax as we begin to empathise with the characters. "The cinematic material dictated a style to me, a very slow rhythm determined by nature, the landscape, the country. The script had to retain some of the rambling quality of the novel because that in itself contained a clue to the authenticity: life in a poor Bengali village does ramble." Harihar returns, unaware of Durga's death. In a jovial mood he calls out his children. Without any reaction, Sarbajaya fetches water and a towel for him. Harihar begins to show the gifts he has brought for them. When he shows a sari that he has bought for Durga, Sarbajaya breaks down. We hear the high notes of a musical instrument "Tarshahnai" symbolising her uncontrollable weeping. Realising Durga's loss, Harihar collapses on his wife. We see speechless Apu, for the first time taking the centre stage in the story. Till now the story was seen through the point of view of either Sarbajaya or Durga. It is only in these final moments that we see Apu as an independent individual.